I cannot be the only person that sees coconut oil life ‘hacks’ everywheeeere and, for quite a while now, I’ve wanted to test them out in a ‘myth busters’ style post. So, I’ve scoured Pinterest and found some hacks that are pretty cool that I thought I would give a go in this post! Btw, I am actually a major coconut oil fan, but I only really using it for cooking instead of vegetable oil. 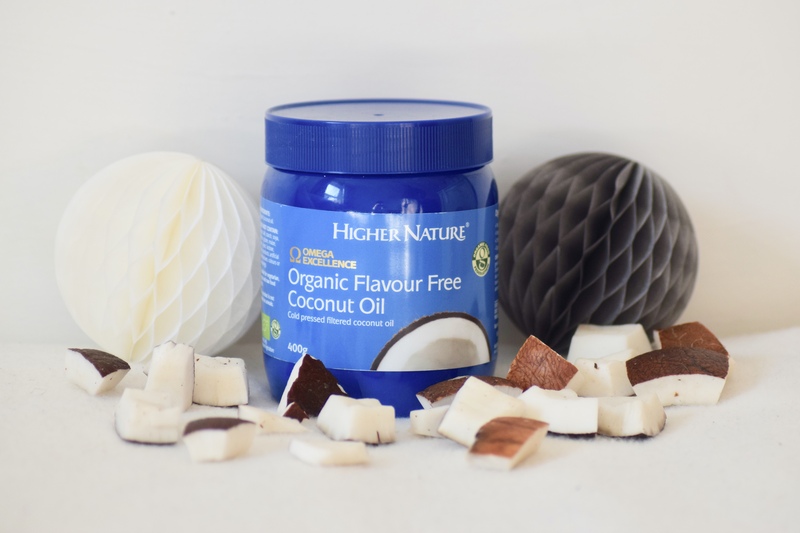 Higher Nature* were kind enough to gift me a pot of their coconut oil in exchange for this post! Their coconut oil is actually flavour and aroma free, so you get all the benefits of coconut oil, without the taste! Although I do quite like the taste of coconut oil, I can definitely see why there would be some meals that it just doesn’t go with, so this flavour free option is FAB. It’s also Vegan, gluten-free and certified Organic- pretty good! Ok, so let’s put it (and the hacks) to the test…. As I said, I am a major coconut oil fan when it comes to cooking. So, it’s no surprise that I LOVE this hack. I tried cooking at a high heat for my stir fry, and actually found that this coconut oil, specifically, performs really well for this. Usually I have to turn the heat down to medium around half way through as the oil begins to burn, but this didn’t happen when trialling this oil! Plus, it’s flavour free which works great for my classic garlic and soy stir fry! I also tried buttering my toast with the oil but, I’ve got to say, this hack isn’t for me! It wasn’t too bad, but I missed the taste of butter a little too much for this to be a permanent replacement hack. This actually works really well! I simply melted the oil, added a few drops of my favourite moisturising Rosehip oil, and then set in the fridge (using a shot glass as I don’t have a fancy tray, oops!). One shot glass worth was actually the perfect amount for a nice soak, and my skin felt super soft afterwards! Hmm… I really wasn’t a fan of this one whilst I was letting it dry. Yack, it didn’t feel good! And, after I washed it off, it made my hair look greasy and horrid! I would NOT recommend this ‘hack’! This actually works surprisingly well! The oil is soft and gentle on the eyes and removes makeup with just one swipe, plus it moisturises at the same time; win win! Hmm.. I kinda get where this is coming from, but it kinda just makes your skin look a bit oily. Half parts moisturiser and coconut oil, with a few drops of my Rosehip oil and my Essentialle lack lustre oil and wow; this makes my skin feel good! I’ve been using this every night since I tried it, I bloody love it! This is such a fab use for coconut oil! Makes your skin feel amazing afterwards too, very impressed! I really did not expect this to work very well, lemme tell ya, but it actually really surprised me! The salt scrubbed away products and dead layers of skin, and the oil moisturised my skin perfectly! I simply keep mine in the fridge, and then melt in some hot water a few minutes before I want to use it and then voila; the perfect salt scrub! I’m not a massive fan of oil pulling, and I don’t enjoy the feeling of swirling coconut oil around my mouth. However, as this is flavour free, it is slightly more pleasant! So there we have it! Have you tried any of these coconut oil hacks? If so, did they work for you? Thank you so much to Higher Nature for sending their product over, and if you’d like to purchase it for yourself, you can do so HERE. *This product was sent in exchange for this post. For more information, please see my Disclaimer. Ah thanks for the warning, I won’t be using coconut oil as a hair treatment anytime soon! I never actually thought about using coconut oil as a shaving balm but now that you mention it I can just envisage how soft my legs would feel afterwards, defos going to try that out! I love this blog – its so usefull and helpfull. Next Post My Guide To Leicester; Instagrammable Places, Food and Drink and Where To Go!